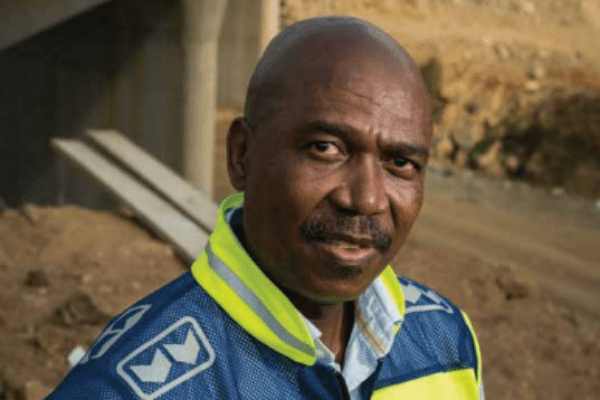 Engineer and project manager Thabiso Ngozwana gives us a glimpse into his work for the South African National Roads Agency (SOC) Limited. Thabiso wishes he was involved in the building of the Golden Gate Bridge in San Francisco. “It’s such an iconic structure,” he said. The most fulfilling part has to be my contribution to improving the socio-economic conditions of communities. You can often see measurable changes in people’s lives – better houses being built, the presence of public transport where previously there was none, public facilities springing up and the acquisition of cars in the neighbourhood. The worst part of the job is being caught up in project disruptions, which are sometimes due to things that may have nothing to do with the project and are totally beyond my control. I prefer bridges. Each one is unique and that’s what makes it special. Bridges have character – that’s why they’re given names. Also, bridges generally have the greatest impact on society, in that they connect communities and provide safe crossings over natural and man-made obstacles. Which structure in the world do you wish you had designed? It has to be the Golden Gate Bridge in San Francisco. It’s such an iconic structure. It was known as the “bridge that could not be built”, because of complications like high winds and tides. Plus, it’s beautiful! It’s one of the Seven Wonders of the Modern World and, though it was built way back in the 1930s, it remains a landmark to this day. Any myths around engineering you’d like to bust? That engineering is boring and complicated. Engineering concepts are based on the laws of nature and common sense, so it’s not actually that difficult to understand. It involves building things that meet the everyday needs of people – like water, roads and shelter. Engineers are certainly not boring and most of us have a wicked sense of humour. What made you decide to become a civil engineer? I suppose it started with a childhood fascination with breaking things down and then remaking them. I used to marvel at all the big earth-moving machines that could literally move mountains and carve order out of chaos. I also began to appreciate the role of civil engineering in the development of society. What’s the biggest project you’ve worked on for SANRAL? My biggest SANRAL project is the R61, section 8, from Mthatha to Ngqeleni, worth R550-million. It involved the construction of a dual carriageway road and bridges. This project, which is in the OR Tambo District Municipality, straddles the King Sabata Dalindyebo and Nyandeni local municipalities (Mthatha being the main town). So who is Thabiso Ngozwana when he’s at home? I’m a single parent of twin boys. I enjoy reading news, hiking and watching Formula 1, cricket and soccer. I settled in Port Elizabeth in 2013. I’m originally from the small Eastern Cape town of Matatiele in the western foothills of the Drakensberg Mountains, next to the borders of KZN and Lesotho. I obtained a Bachelor’s and Master’s degree in civil engineering from institutions in the US (South Dakota School of Mines) and Australia (University of New South Wales), respectively. Well, the majority of my allocated projects are in the former Transkei, so I’m on the road for about one week out of every month.